In multilingual collaboration, a paucity of shared language and gaps in the language backgrounds of group members could bring about imbalanced participation, which is likely to hinder problem solving, idea generation and collaborative learning. 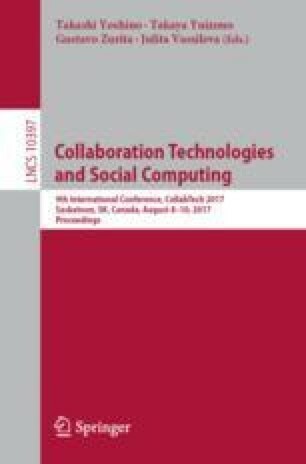 This paper proposes a model of best balanced communication based on the Quality of Messages among participants using various languages. We describe a method for selecting the languages to be used with machine translators, and how to create the best balanced communication environment. Currently, many studies on machine translators and balancing conversations have been published, but none have attempted to balance asymmetric participation in multilingual groups. Our vision allows machine translation technologies to enhance the communication between humans with different language backgrounds in terms of balancing their participation. We conduct controlled experiments and find the proposed method successfully enables users to interact and communicate with better equality while minimizing the problems that can arise from machine translation usage. This research was partially supported by a Grant-in-Aid for Scientific Research (A) (17H00759, 2017-2020) from Japan Society for the Promotion of Science (JSPS), and the Leading Graduates Schools Program, “Collaborative Graduate Program in Design” by the Ministry of Education, Culture, Sports, Science and Technology, Japan.